Gifted storytellers and musicians will retell Wales’ most famous story in a production by Cromford-based Adverse Camber. 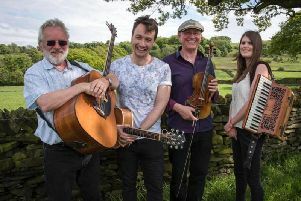 Storyteller Michael Harvey teams up with acclaimed musicians Stacey Blythe and Lynne Denman to bring the story of the Fourth Branch of the Mabinogion to two festivals in Derbyshire. This story of betrayal, revenge, love, honour, magic and transformation transports audiences to the living landscape of North Wales and its brilliant night sky. It is brought bang up to date for modern audiences. The new production, entitled Dreaming The Night Field - A Legend of Wales, will be premiered at Wirksworth Town Hall on September 14, as part of the town’s festival, and at Derby Guildhall Theatre on October 6, as part of the city’s folk festival.